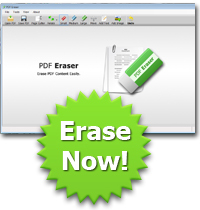 If you got a PDF document contains unwanted text and images, you can use PDF Eraser to erase them and save to a new PDF file. Erasing is not the only thing PDF Eraser can do. You can use the program to add your own text and pictures into the PDF as well. PDF Eraser can rotate the PDF pages also. It will help you to rotate the PDF pages to the correct orientation. You might find some PDF pages are unnecessary, so you can use the built-in PDF Page Cutter to delete unwanted pages.